Gigi has finished the first sleeve of the Water's Edge and is working on the second one #matchymatchyKAL. There is discussion about buttons, and Genevieve's Mini Water's Edge. We are doing #projectSweaterChest with Susan B. Anderson, and #FitFlatterFeelWonderfulKAL with Susan B. Anderson and the Knit Girllls. 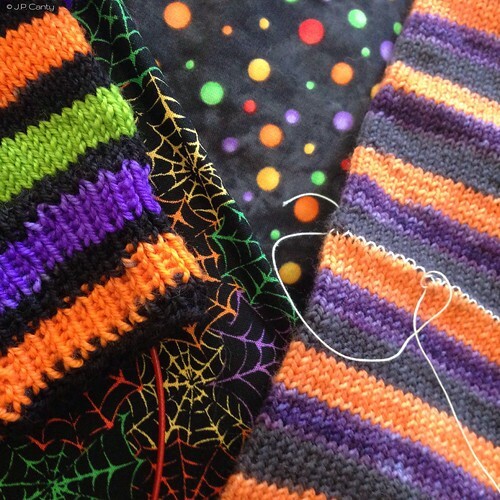 Jasmin is working on the Hocus Pocus socks from Mint Rain for #operationsockdrawer. Also the Knit Girllls are having a Halloween Craft Along that you could double dip. 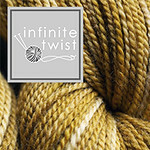 Gigi has bound off the Asterope, and she is planning to cast on a Sivia Harding design from Book of Cowls out of Bijou Basin, Himalayan Trail Yarn. Gigi has finished the vanilla socks in the animal print pattern and has cast on tubesocks for Genevieve. She has also finished the Dianthus Superbus socks from The Knitters Curiosity Cabinet, Vol I, out of Wildfoote, and started the Linaria Bipartita, and she is knitting on Mystik Spiral socks, she has one pair out of Regia Mini Ringel, one out of Opal Van Gogh, Ocean Depth out of Mint Rain. Gigi has balled up her "Je suis prest", from Gingertwist Studio in Edinburgh for a pair of socks, put it in her tartan bag from the Caithness Craft Collective, and is looking for a sock pattern to knit it out of. Jasmin talks about our Dreadfully Delayed Interview Series: Franklin Habit, Maggie Jackson, Jane Patrick and Barry Schacht, Jean Frost, Sandi Rosner. Ten more to come. We have Bijou Basin yarn for prizes. (Thanks, Bijou Basin! ), a skein of sock yarn in the "Je suis prest" colorway, from Gingertwist Studio in Edinburgh. This week Gigi talks about having an effective closet. Gigi managed to knit her Dianthus superbus socks on different size needles. One sock is too tight to fit comfortably. And, she cast on for the Linaria Bipartita out of Knitter's Curiosity Cabinet, and turned he cuff inside out. Gigi did a bit of spinning but needs to see her wheel so she can remember to spin 15 minutes a day. We mention how much we like the Knit Girllls' Stash Dash. Jasmin is tasting tribbles from Gourmet Stash. Gigi has been sewing on the Nemesis dress for Melanie from the Savvy Girls. Jasmin and Gigi have been sewing up a storm of project bags. You can find the tutorial here. We mention bags by Erin Lane and the Fat Squirrel Speaks, Omnigrid rulers . Jasmin waxes rhapsodic about her Singer Featherweight sewing machine.